Nature = Frida Kahlo’s painting is painted in the year 1939 in oil on canvas with dimensions 173 x 173 cm, it is located in the Museum of Modern Art of Mexico. 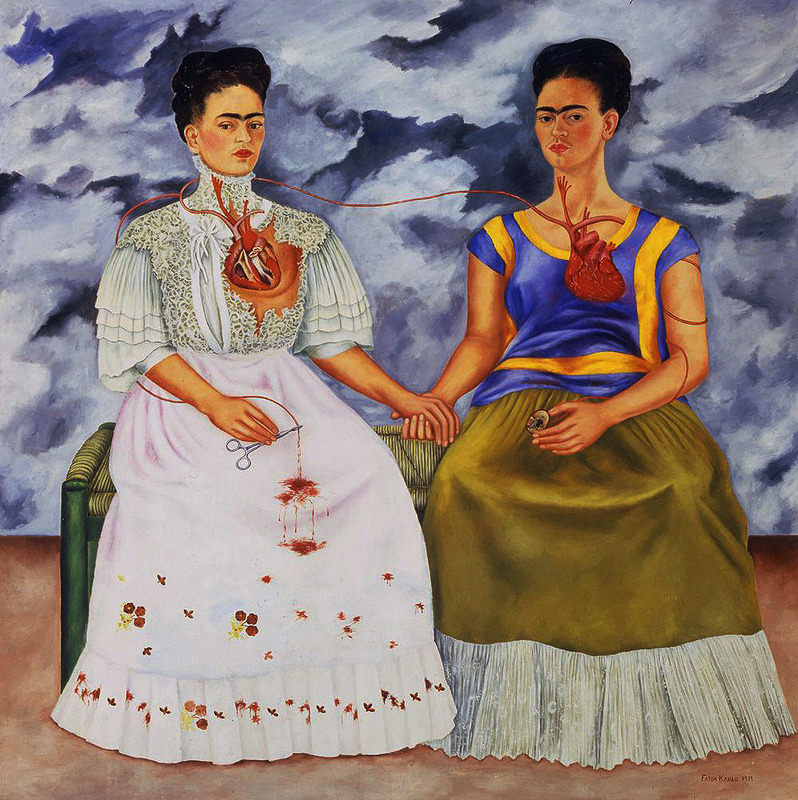 Impression = The first thing we see in this painting is a double self-portrait, where the two Fridas are sitting on a wooden bench with straw, you can see over your clothes the heart, which is connected by an artery to the heart of the second Frida, in turn they are united because they are taken by the hands. Each Frida is dressed in a different way, it is said that one represents the European Frida and the other the Mexican Frida; The European shows in her right hand a few words, her white dress is stained with blood, her heart is not complete; while the Mexican Frida has in her right hand a mini portrait of Diego Rivera, and her heart is complete. The first impression that this work gives us is the duality of a woman, it is the double vision that Frida has on herself, that on the one hand she is strong and in love and on the other she has a completely broken heart, in this Frida is given to notice the pain and suffering that this causes her because her white dress is stained with blood. The line / color = this work is strongly marked by the line, especially as regards the two human figures, which have a drawing ending; However, she does not abandon the color as she uses it to make the difference between the two: one dressed in white shows her European side (her mother was Spanish), as well as what her society expects and the one that is dressed more colorful is the Frida Mexican, and it’s the clothes she wore to please her husband (Diego Rivera). The background is marked by color, especially by the non-colors as it is like a sky full of new colors in white, black and gray and the ground is earthy. Light / volume = the figures have volume, they are not flat, play with the use of light to give notice the texture and volume of both the clothing and the sky and the floor, the hearts appear as flat figures on the chest of each one, noting as if it could be seen through the skin. Space = seems they are abroad and that basically is reached only see a gray sky full of clouds hairpin black, white and gray; the ground is as if it were a park or an open place since it is the same color as the earth, noting that they are sitting in a field, or somewhere where the contact with the earth is direct, since there is no type of element that stands between the Fridas and the earth. Composition = Frida Kahlo opts for the use of linear perspective, putting the vanishing point in the union of the hands of both Fridas, in this way the center of the work is the ambivalence that a person can have, in this case herself , but at the same time these two different parts are deeply united. Everything is arranged so very specific to the viewer’s attention on the Union center, scissors, arms, mini portrait of Diego Rivera, the bodies of two Fridas are slightly inclined, are pointing hands towards the center of the work. The great contrast that exists between the closed and stormy sky with the warm and burning of the earth makes notice the duality that exists between heaven and earth, life and death, the latter is best reflected in hearts, and that one is in perfect state beating and the other is completely broken which marks a great contrast to note the duality sky-earth, life-death, the latter is best shown in hearts since one is beating and the other is completely broken. The theme of duality is present in all aspects of the composition of “two Fridas”. B) Historical analysis (what we inquire). 1. Historical context: In 1939 this peculiar work was painted, this year is very important and is considered a key point for the universal and Mexican history. In the universal history some events happened that would mark the destiny of the world in the next years, for example the discovery of Otto Hahn (German physicist), who discovered the formula to create the atomic bombs (used during the Second World War), the great evacuation of English from their cities because of bomb threats by the bad relationship that had at that time Germany and England, in general in the European environment there was an atmosphere of fear by the bomb threats and the rise to power of the Nazis . The world leaders of the time were: Gandhi, who fought for the freedom of India, Stalin, he created a regime of terror through the death of many Russian peasants, Mussolini, tried to create a new Roman empire and in Spain was Frank, the great dictator who began his regime this year, which ended with his death in 1975, this last event was of great importance and greatly influenced the history of Mexico. The Spanish Civil War was a social, political and military conflict that began with the rise to power of Franco, this war was divided into two camps: the Republican, was organized around the legitimate government of Spain, the Popular Front, was supported by the workers movement, the syndicates and the constitutional and national democrats, was formed by a large part of the military command, was supported by the fascist Spanish Falange party, the Catholic Church, the conservative right and by the privileged classes of the time (bourgeois not liberals, aristocrats, landowners, etc.). As a result of the war many Spaniards exiled in Mexico, which at that time was characterized by welcome with open to all those fleeing the problems of his country arms, but without a doubt the group of Spanish exiles was the group biggest, thousands of Spaniards fled defeated. At that time the president of Mexico was Lázaro Cárdenas, his government sympathized with the republic since the beginning of the Civil War, and one of the main objectives was to rescue from the war and the French camps all those who were against the great dictator of Spain. It is estimated that 25% of the exiles were intellectuals or elite, for them the house of Spain was founded in Mexico, this place was focused so that all of them could continue with their research and work in their specialty away from a hostile environment, This represented a great advance of culture, education and scientific research in the welcoming country, that is to say that the American continent was enriched in an important way with the arrival of all these intellectuals. Specifically in the field of plastic arts the Spanish exile was distinguished by its complexity. In Mexico there was at that time a local artistic tradition that comes from the revolutionary process, the latter is identified as the Mexican School of Painting, in which it was difficult to penetrate the art of Spanish exile. After the 1919 revolution, Mexican art was in search of a national identity and a movement called muralism was born, represented by: José Clemente Orozco, Diego Rivera, David Alfaro Siqueiros, etc. they took the murals to public buildings where they told the story and the ideology of a new Mexico that took up the wealth of the past, its traditions and pre-Hispanic folklore. After muralismo (nationalist load), it was very difficult to accept the new currents coming from the outside but finally Mexico is one of the arts world stage thanks to the insistence of bringing new styles to Mexico by some artists. Surrealism was one of the styles that penetrated thanks to the arrival of André Breton (1939), an exhibition was organized in which internationally recognized artists participated with Mexican artists (Picasso, Miró, Magritte, Diego Rivera, Manuel Rodríguez Lozano, Roberto Montenegro, Carlos Mérida, etc. ), this exhibition aroused the interest of many Mexican artists and shortly after he made the work of Frida Kahlo called “two Fridas”, although she has stated that her style was not surreal in this work you can see many elements of that style. Frida was the third daughter of Guillermo Kahlo, photographer of German-Hungarian origin and Maltide Calderon, Mexican of Spanish descent. His life was marked by physical suffering began as a result of a disease called poliomyelitis that he contracted in 1913, as well as several diseases, injuries, accidents and subsequent operations. The first illness left him several permanent sequelae, such as the much thinner than the left and right leg. In 1925 he learned the engraving technique in the hands of Fernando Fernández Domínguez, in that same year he suffered a tram accident where he broke several ribs, the neck, the pelvis, his spine was practically broken, this was thanks to a handrail it pierced his belly; As a result of this accident she underwent many surgical operations throughout her life and forced her to use different types of corsets with different stretching mechanisms. This accident was important in her career as a painter because, thanks to the boredom caused by her prostration in bed, she began to paint and in 1926 she painted her first self-portrait, it is the first in a long series in which she expresses the events of her life and their emotional reactions to them. Frida had great strength, this allowed an important recovery resulting in a friend of his introducing her into the artistic environments of Mexico where she met her future husband, Diego Rivera. In 1929 the artist married Rivera, their relationship was marked by the adventures with other people and they qualified as having a love hate relationship, which culminated in 1939. In 1939 Frida Kahlo painted a self-portrait called “the two Fridas”, in order to assimilate her recent divorce, it is said to be the expression of her feelings since she always used her works as a means of expressing her interiority as well as to release her tensions and feelings. Frida expresses her own experiences in her works, it is exactly what she is living in her present, how she interprets it and how she believes that others live it. She paints after her divorce, as already mentioned before, “Las dos Fridas”, which we can locate within Surrealism (1939), because the surrealists do not want to copy reality but prefer to capture their reality, which is what they interpret of her dreams, or in the case of Frida, her own experiences, since she was able to create wonderful works from them. Surrealist avant-garde art aims to transmit pain and seeks to break with the traditional and it is precisely because of this that her work is located within this avant-garde because she pretends to express her pain through the duality that she feels at that moment, although they represent something totally contrary are strongly linked by a blood bond (united hearts), as well as at the level of touch (the joined hands). 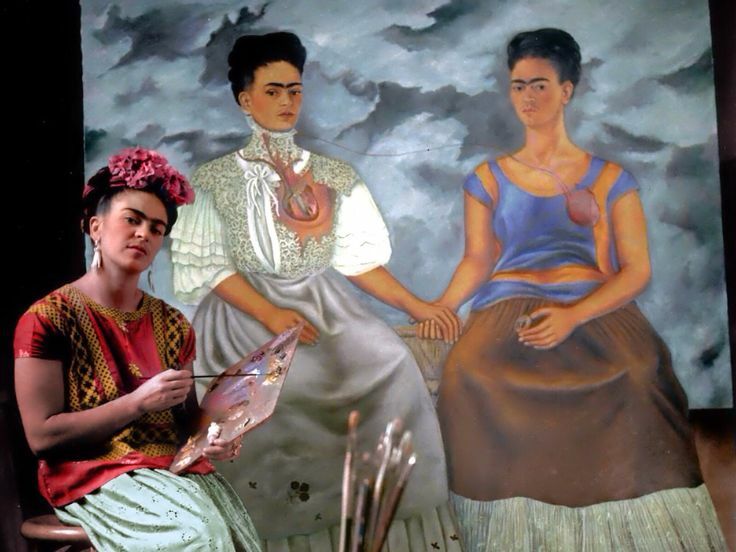 Frida differs from the surrealists because she does not pretend to paint her dreams or liberate the unconscious, but through the technique of surrealism expresses her own experiences, which emanate suffering; for example in “the two Fridas” uses the collage when placing the hearts in the chest of both Fridas, since these seem superimposed in the main image. Therefore it can be concluded that her work is characterized by the synthesis of expressionistic elements (because it aims to express its interiority) and Surrealists and their main theme through all his works is the autobiography. With this work, Frida tries to assimilate her emotional crisis caused by divorce; appear two Fridas sitting on a green bench, one of them is dressed in a suit of Tehuana (typical Mexican), Diego’s favorite, and the other is marked by his European roots, is what existed before meeting Diego, this ultima is dressed in a corseted suit, like the ones she wore when she had the accident. The hearts of the two women are connected to each other through a vein, but only one of the hearts is alive, that of the tehuana, because the one of the European is completely broken, this is the double vision that she has of same at that time. The vein that connects both hearts represents your pain as a result of divorce, also represents the union between two worlds divided. This union is cut by the scissors that the European Frida has in its hand, this symbolizes that it cuts with the flow of pain that it is currently living, this cut causes a great blood stain on the white dress worn by the European. The Mexican has in her hands a mini portrait of Diego, from there comes a vein that connects directly to the heart making reference to the fact that her heart is hurt because of the loss of her great love. At the center of the work is the union of the hands of both Fridas symbolizing the two parts of herself, on the one hand modern and current and on the other hand are her roots that should not be forgotten, she wants to be herself but wants to hide and cut that pain and do it being another. The previous scene is located in a totally unreal landscape, the sky is gray and very closed, preaching a great storm that is coming soon but the two Fridas seem not to react as they are sitting without any gesture showing a state of trance between the sky and the earth, life and death and finally the most important contrast is that of the destroyed heart and the whole heart. It can be concluded that Frida Kahlo through this work wanted to say or rather express the deep pain she felt because of the end of a complicated relationship full of problems and emotional wounds; that’s why in a Frida the heart is destroyed, completely broken, this shows that a part of her died, because her ex-husband took her away leaving her adrift in a world full of suffering that she tries to cut with the scissors that this Frida herself in her right hand, but she can not get it since her white dress is stained by the blood that falls from the vein that is connected to the broken heart, this symbolizes that now she is a stained woman because she is divorced, something that That time was very strange and people used to judge a lot of women who went through this. On the other hand you see a woman who was once in love, with a strong heart, large and beating at high speed, she has in her right hand a mini portrait of her beloved, is dressed in her husband’s favorite dress and both are united through a vein that connects to their hearts, this means the union between the present and the past. This was the first self-portrait that he did on a grand scale, it can be deduced that he did it in this size symbolizing the great emptiness that he felt in his interior and he managed to express it not only in the emotion and dramatic force of the work but also he did it to through the use of a large space because only there could fit that enormous suffering. Her work is influenced by the work of Diego Rivera since he adopted the use of wide and simple color areas; She wanted her work to be the affirmation of her Mexican identity, for that reason she always resorted to techniques and themes extracted from folklore and folk art of her country; but in this particular work it is clear that in addition to this fantastic elements were added with an introspective character, as well as the free use of the pictorial space where incongruous objects were gathered in order to enhance the impact of his work, for example in the work analyzes we can see the scissors as an object of this type. -veins = is the only one that unites the two hearts of Frida. -Mexicana = duality that represents the picture after his divorce, this is the part that Frida de Mexicana has and that is why she is dressed in a typical costume (Tehuana). -European = is the other part of the duality and represents a more liberal Frida with a European suit and who is willing to fight against pain. – Blood = Frida hurt, is spilled on her dress as a result of her wanting to cut off the flow of blood that goes to her wounded heart. -Portrait = the Mexican has a mini portrait in his right hand, it is Diego’s, he is connected with his healthy heart and in love. – Heart hurt / broken = Diego and Frida had a stormy relationship and when they divorced she suffered a lot, this as a result of her delicate health condition. -Frida = she was a fighter, an activist, she had a tragic but tireless life, her biography is reflected in her work. Ordóñez, Alonso, Ma. Magdalena, dirección de estudios históricos-INAH, “Hemerografía del exilio español en México, 1930-1950”.